The importance of drinking water quality on the production and performance of pigs is often overlooked/ underestimated. 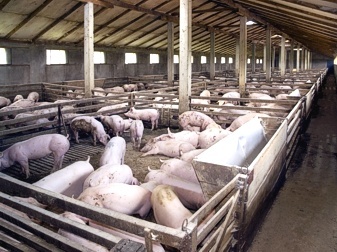 Pigs consume 4-6 times as much water as feed; sows consume as much as 10+gallons of water per day. Without an adequate supply of good quality water, pig growth and reproduction can suffer. The key is- not just the adequate supply of water, but good quality water. Water can be a source of contamination if the microbiological load in the water is too high. This can also affect digestion and absorption of nutrients from the feed, as well as additives like medications, vaccines and vitamins. Health issues linked to, but not limited to, drinking contaminated water include gastroenteritis, diarrhea, salmonellosis, listeriosis, typhoid, cholera and hepatitis. Routine drinking water additives like vaccines and vitamins contribute to a polysaccharide layer inside the drinking lines, commonly called slime. The microorganisms attach to the inside of the line and develop and flourish within this layer. The water borne bacteria are difficult to kill due to their encased cell wall and protection within the slime. Most water treatments and disinfectants, including chlorine, cannot penetrate or degrade the cell wall, nor penetrate and eliminate the slime. Routinely washing waterers and flushing water lines is not enough because these practices do not remove the source of the problem inside the drinking system. Even with good quality water, problems effecting health and performance can occur because the contaminants are inside the lines. This will lead to healthier, better performing pigs with a lower overall cost. By combining 2 separate powders in tap water, GO2 produces a 99.9% pure chlorine dioxide solution at a concentration of 4,000ppm which is simply dosed into the drinking water system.